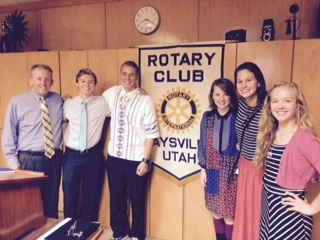 The four students selected to represent Davis High School and the Kaysville Rotary Club reported on their experiences at RYLA. Alyse Brimhall, Zach Bryan, Logan MacKay, and Zoe Johnson were interviewed and selected to participate in the 2014 Rotary Youth Leadership Awards (RYLA). It took place September 17th - 20th at the Heber Valley Camp. Each student reported on the positive impact it had on them individually, as well the increased desire to find a need and not wait for someone else to do something, but to jump in and do it themselves. Katelyn Hall also returned to RYLA this year as an alumni mentor. Having attended last year's RYLA she was excited to help others also catch the spirit of Rotary. The Kaysville Rotary Club is always proud to send phenomenal students from Davis High School who always represent the Rotary spirit of service at RYLA. Each student was challenged to continue with what they learned by participating in the Davis High Interact Club, which is a service club sponsored at Davis High School by the Kaysville Rotary Club.